I am so thrilled with our first attempt at glue batik. Batik fabrics are usually created using wax and fabric dyes. We used a simplified version I found at That Artist Woman which uses blue gel school glue and acrylic paints. The kids had a fun time making their Easter designs ( spread over two days ) and the end result is really pretty. After all the artwork pieces were finished, I made them into this really Easy Easter Table Runner. First, our Easter Egg Glue Batik creations! Next, the process we used to make them. 1. 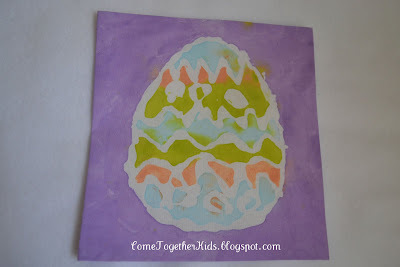 Because we were doing Easter eggs, I drew an egg shape on a piece of paper under our fabric to use as a guideline. You can do that with any shape or design, or just do a freehand design. 2. Using the glue, outline your shape then fill it in with your pattern of choice. Wherever there is glue will stay white, so keep that in mind when deciding how thick or thin to make your glue line and what areas to cover. 4. When the glue has dried, get ready to paint! I put down pieces of waxed paper, then watered down regular acrylic paints. It was easy to paint on and gave a cool watercolor effect on the fabric. ( I didn't measure, but I'd say roughly half paint and half water, maybe a little more paint). He was a little reluctant at first, but ended up really enjoying it. 5. You can paint right over the dried lines of glue to cover your whole panel. 6. When finished, set your panel aside and let the paint dry all the way. Rinsing off the glue and excess paint. 8. That's it! Wring out your fabric and hang to dry or pop it in the dryer. Then use it to make something special. Awesome!!! I can't wait to try this with my kids! Great project! I will definitely have to try! These are so awesome!! Thanks for sharing! Love how these turned out! I want to try this method! Fun...I've never seen that before :) I love your blog design! Lovely tutorial! I love how you replaced the wax with glue! Great Craft! Just featured it on Craft Gossip...I am due to have a baby anytime this weekend, so I'm glad I checked my computer and got your tutorial in! Happy Easter! I love this! I went out last night and bought everything to make these with my three kids. I have a Mother's Day gift in mind. I will send you the pics when we are done! Keeping this in mind to do with my sons...Great idea! They look beautiful and festive. I can't wait to try this one! Thanks for sharing at For the Kids Friday! I've featured you this week! Hope to have you back to link up this week! Ok... I'm totally BUMMED! I was so ready to do this for a party activity for my daughter's birthday tomorrow, and couldn't find the glue ANYWHERE at Walmart. I have some at home, but not enough. Ugh. Plan B I guess... and definitely one for the future! That is... if I can find the glue! ويجيب على تساؤلات عملائنا الكرام خبراء على أعلى مستوى حيث يقوم خبراء شركة تنظيف منازل بالدمام والمتخصصون في مجال التنظيف والصحة العامة على تقديم إجابات وافية على استفسارات عملائنا وتقديم حلول للشكاوى المقدمة وسط الحرص على استخدام أحدث التقنيات وبالاعتماد على مواد طبيعية تحافظ على صحة الإنسان ولا تكون عبء على ميزانية المنزل. If over the counter products aren't enough to help you manage oily skin, talk to your dermatologist. Lasers and chemical peels can help reduce oiliness and improve the overall look of your skin. Creams laced with tretinoin, adapalene, or tazarotene can also help by altering pores and reducing oiliness. Two years on, Shanahan is poised to helm mechanic shirts a very different institution: the most powerful military force on earth. On Sunday, President Trump said he would name Shanahan, who had been serving as deputy big baller brand shirts secretary of defense since July 2017, as acting secretary starting Jan. 1. This is Why I Love Them! Kids + Mud = SMILES!